For my birthday, I decided that I wanted to have a photobooth with LOTR-related props for guests to play around with. Gandalf's staff is perfect for reenacting "You shall not pass!" moments, and I figured it would be easy enough to DIY. You will need a long wooden dowel with 1" diameter, a brown paper grocery bag, masking tape, a hot glue gun, paint, some kind of varnish/finish, clear packing tape, a small LED light that will stay on without you holding it, and craft glue (Elmer's or some other tacky glue). I bought my dowel at Home Depot for about $3.50, but it only came in 6' lengths. To get the right length, I ended up sawing off about 10". You'll need to adjust for your own height, but I knew it wanted the finished staff to be about the same height as the top of my head. If your dowel has a rough surface, you may want to sand it lightly to get a smoother surface. To get the twisted branches look for the top of the staff, I ripped a brown paper bag into strips ~2" wide (does not need to be exact) and twisted them up. I left the ends of the strips untwisted so that there would be a flat base to tape to the dowel. Make sure that you have a variety of "branches" in different widths and lengths. To keep the branches from untwisting, I added some masking tape, but do so sparingly so as to preserve the grooves and color of the "natural" bag. Prepare a bunch of varying lengths of masking tape and start heating up the hot glue gun. Gandalf's staff has two larger branches twisted together and coming out to the side, so I started there. I took the two largest twists and taped the bases to the dowel, twisted it up and around, then used more tape and paper to prop the branches out to the side. The rest of the top of the staff is just a big mass of branches twisting up and making a rather large clump. I just looked at a picture of his staff and tried to approximate the look with my twists. To keep it from looking too uniform, I made sure to vary the direction and width of the twists I used. I also added a big crumpled up bunch of paper to one side to get the look of the large knot. Eventually, after adding enough twists, it will be too difficult to secure them at the top with masking tape, so you will need to use a hot glue gun to stick the tops down. The light will eventually rest on the top of the dowel, so don't cover that with the twists. I took the bag handles and crinkled them a bit, then taped them to the middle of the staff. This adds some visual depth/texture to the rest of the dowel so that it doesn't just look like, well, a dowel. If you tape the paper edges only, and leave the middles loose, leaving some space between the paper and the dowel, you can squeeze the paper down and it will make more realistic-looking grooves than just making the paper "skin tight" around the dowel. Use the masking tape sparingly, as later on the straight edges will be harder to camouflage with paint. I only added paper down to the middle of the dowel, but if you have more bag handles and patience you can work all the way down the dowel. Once I was pleased with the arrangement of the branches on the dowel, I painted it. I just used the cheap acrylic craft paint that I already had; it's about $0.39 a bottle at Michael's or Jo-Ann's during sales, both Americana and Folk Art brands worked just fine for me. I used a base of Raw Sienna to cover up the masking tape and paper, then mixed up another, darker brown to add some more depth. I don't think the second coat really adds a whole lot, though, so for sake of simplicity I only included those two colors in my initial materials list. But if you're wondering, my second coat was a mixture of orange, green, red, black, and brown. After the paint dries, it's time to add the weathering! I mixed up a little bit of black paint with some water and painted it on, making sure to get into all the grooves and divots of the branches. After a little bit of time for it to dry, I wiped off the excess watery paint with a paper towel; this leaves the darker color in the grooves where dirt would normally accumulate, and leaves the lighter brown at the high points where constant handling would naturally polish the "wood." 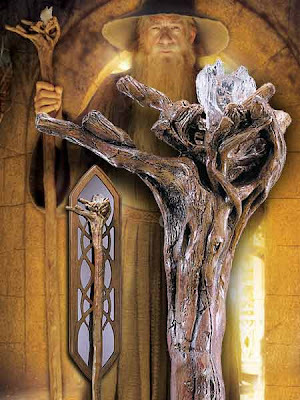 Gandalf's staff is polished wood, so the matte finish of the craft paint doesn't look quite right. I added a layer of clear varnish to the whole staff to make it look a little shiny, as if from years of oils from handling had burnished the wood to a shine. Hah! Can you tell I'm just making things up? I used a random Delta Ceramcoat Matte Interior Varnish that I already had, but I'm sure any other slightly glossy finish would work. Even though my varnish says it's matte, I know from prior experience that it's still glossy once dry. Step 6: Make the Glowing Crystal. I purchased these submersible LED lights from the florist section of Michael's. To get the jagged crystal look cheaply, I used clear packing tape to "build" a crystal over the light so that it looked more or less like the one on Gandalf's staff. I began by encircling the LED with a strip of tape, sticky side out. Then I cut several slits in the tape and sort of folded those sections together to make the individual spikes. By layering more and more tiny strips of tape, I managed to approximate the faceted look of the crystal. Make sure that you can still remove the LED from the tape, though! After I finished making the "crystal" covering, I tried it on the LED and put the whole thing at the top of the staff, then trimmed the bottom edge so that it fit better with the branches' placement around the top of the dowel. Since the tape is clear, and I wanted to make it a little less obvious that there was an LED inside, I "frosted" the tape with a watered down mixture of silver and white craft paint. The LED will eventually run out, so I just used Elmer's glue or tape to gently secure the base of the LED to the top of the dowel so that I can still remove it to change the battery. Ta da! A cheap (mine cost <$20) wizard staff! Do you paint the wood 2 or only the paper? could´t believe it is from paper. looks really awesome! Awesome guide, I can't wait to try this.